Branding, Identity or Logo! What Is It Really? Apologies for the long hiatus. It’s all been work, more work and even more work – not that I am getting any richer, just that making money is getting more arduous these days but that’s an entirely different story so let’s focus on the more pleasant things in life. Produced by Jerry Bruckheimer and based on the bestselling novel “The Home Invaders” by real-life jewel thief – John Seybold who wrote it under the pseudonym "Frank Hohimer", this movie (initially called Violent Streets) features splendid performances from all its leading stars particularly Caan and Prosky, breathtaking night cinematography, an intricate attention to detail (both typical Mann trademarks) and an impressive hit soundtrack by the German electronic trio of Edgar Froese, Christopher Franke and Johannes Schmoelling, more popularly known as Tangerine Dream. 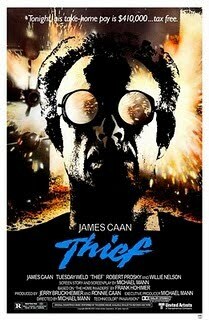 For some strange reasons (believe it or not), Thief’s soundtrack was nominated for 1982’s Razzie Award for the Worst Musical Score but that should not deter you from listening to it. It’s a rare, hard to find filmscore featuring Tangerine Dream at its vintage best - with twanging guitars, buzzed up synthesizers, thumping percussion and a whole medley of other electronic sound gear that all beautifully meld with the movie’s storyline. Released in 2 different versions - one originally featuring Tangerine Dream alone and the other featuring additional compositions by Craig Safan, both these soundtracks are considered rarities now. Present below are download links to both the versions that I have segregated for your listening pleasure. It isn’t 100% accurate though but I hope I have done justice to the original listings. And if you have never seen this outstanding movie yet, I have also added DVDrip video download/streaming links. Enjoy! awesome movie and soundtrack. thanks. great blog too. @Ben - Need to refresh my memory. Will check it out and post it here soon! So, check back later!